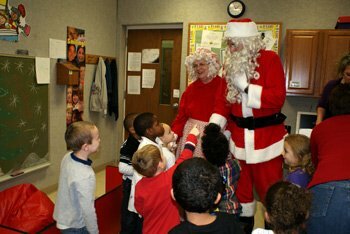 Santa and Mrs. Claus made an early stop at the Barber Institute Tuesday, Dec. 18 to surprise students with presents selected especially for them. Students in the Elizabeth Lee Black School unwrapped books, puzzles, dolls and toys from Santa’s bag. 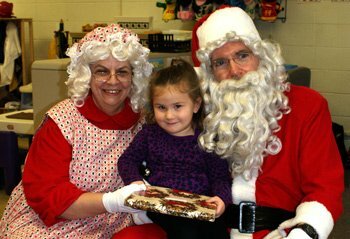 The school’s Parent Group holds fundraisers throughout the year to fund holiday parties, as well as the gifts for students. Teachers in each classroom then select gifts for Santa to distribute to students. After delivering presents, Santa and Mrs. Claus also visited with middle and high school age students at the Jingle Bell Hop. 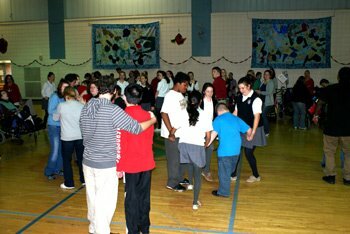 The dance was held in the gym with music and refreshments. Members of the Villa Maria Academy Student Council also volunteered at the dance for a fun and festive time with the students. Santa and Mrs. Claus, who are well known to Joe and Rhonda Schember, are no strangers to the Institute. For 25 years now, they have been filling the holiday roles, beginning when their daughter, Jodi, was a preschooler at the Institute. Now they say that it is their favorite day of the year. Besides their roles as Santa and Mrs. Claus, the couple has been active for many years at the Barber National Institute. Joe is a member of the Board of Directors and serves on the Finance & Audit Committee, and Rhonda has been active on the Ladies Only Luncheon planning committee for many years. In 2008, they served as chair couple of the annual Barber Christmas Ball.